Above and Beneath the Definitive Structure was all about black black black. And structure and shaping. But it was the figure hugging knitwear and velvets which won me over. Shown on Monday 21st February at Freemasons Hall. 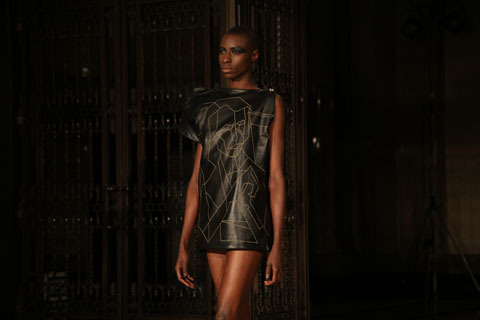 Bunmi Koko A/W 2011 by Toni Bowater. Bunmi Koko was undoubtedly one of my best chance discoveries of last season, this web so it was with great anticipation that I sat down for this show, right, as it happened, next to Lucy Jones – director of Fashion Textiles at the University of East London – who I recognised from the FAD awards last year. Designer Bunmi Olaye is one of her star pupils and in fact still operates out of a studio that the university provides for her. Definitely a big boon for a young designer. 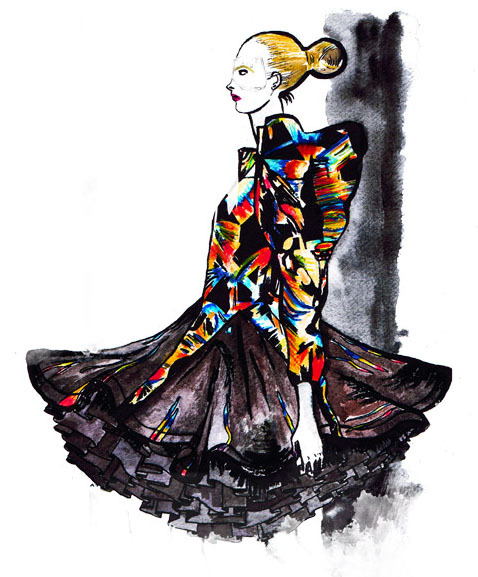 Bunmi Koko A/W 2011 by Andy Bumpus. Bunmi prides herself on her business acumen, which was thoroughly present and correct with the large fabric goodie bag stashed under front row seats. Inside mine was a beautifully presented cupcake (soon to be thoughtlessly squashed) as well as an incredibly thorough press pack that included a lovely set of postcards with fashion illustrations of her S/S collection, an explanatory foldout detailing Bunmi’s achievements and inspirations behind Kaleidoscopia, and then to top it all off a mini newspaper: The Bunmi Koko Times. This girl sure knows how to market herself! 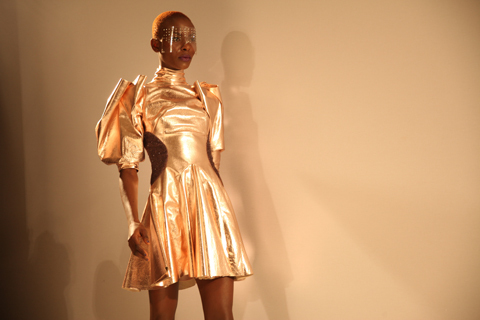 Bunmi’s show began with a short movie – a great idea in theory but a bit odd in practice – involving as it did some clubby graphics and James Bond-ish silhouettes. I wasn’t really sure what it contributed to the whole. Then the show was off with a run – and when I say run I really do mean run. The models were moving quickly at most shows, but at Bunmi’s they were moving at such a lick that it was nigh on impossible to capture them through a lens. It’s a good thing I like to capture models on the hop rather than front on like the paps. 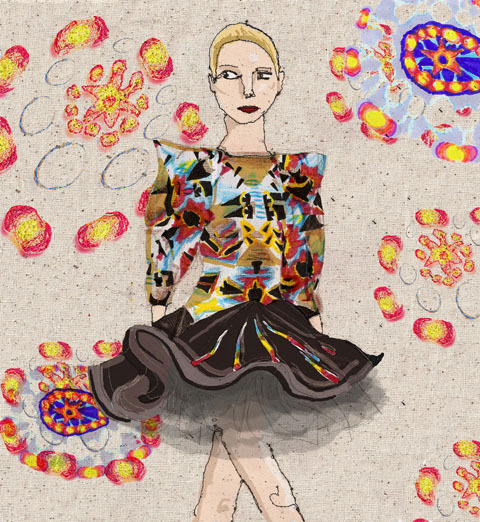 The clubby graphics – inspired by rainbows, supernovas and mirages – splashed across wide tutus, wrap dresses and clutch bags. I particularly liked the clever of use of futuristic ruching over shoulders and across breastbones. 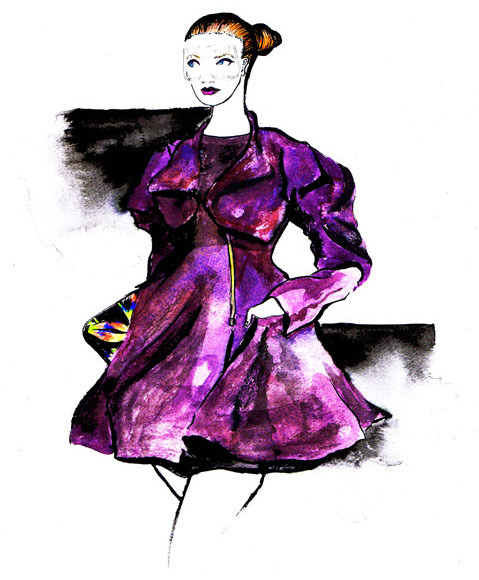 I loved the elegant purple suit and an eye-popping orange woolly dress, which bounced down the catwalk in a spray of moth-orgasmic fluff. I wasn’t so keen on the metallic leather pieces, which looked cheap by comparison. Despite the clever styling with diamante encrusted visors, this felt far less cohesive than her last collection and left me wondering what exactly the Bunmi aesthetic is. It was all over so quickly that I hardly had time to digest it before Bunmi herself spilled out onto the catwalk, grinning broadly and sporting a t-shirt for Fill The Cup – a fashion range that will send profits to feed hungry children across the world. 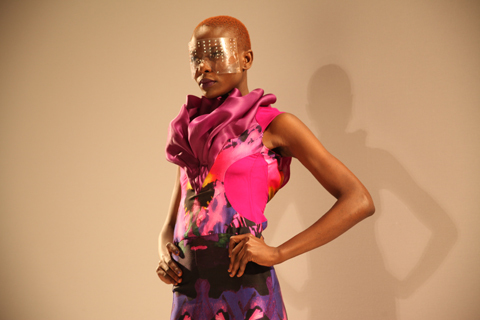 Bunmi Koko A/W 2011. Photography by Amelia Gregory. Bunmi Koko was undoubtedly one of my best chance discoveries of last season, web so it was with great anticipation that I sat down for this show, mind right, information pills as it happened, next to Lucy Jones – director of Fashion Textiles at the University of East London – who I recognised from the FAD awards last year. Designer Bunmi Olaye is one of her star pupils and in fact still operates out of a studio that the university provides for her. Definitely a big boon for a young designer. 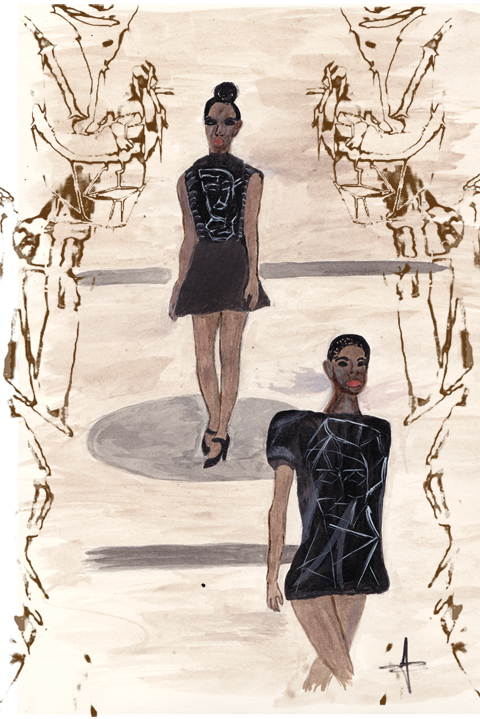 Bunmi’s show began with a short movie – a great idea in theory but a bit odd in practice – involving as it did some clubby graphics and James Bond-ish silhouettes. I wasn’t really sure what it contributed to the whole. Then the show was off with a run – and when I say run I really do mean run. 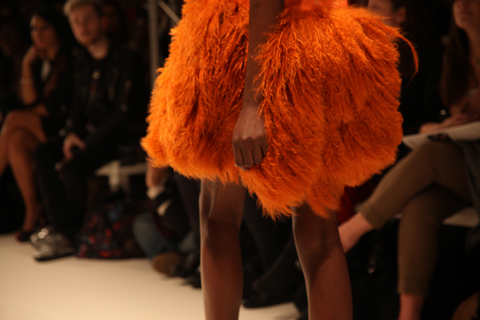 The models were moving quickly at most shows, but at Bunmi’s they were moving at such a lick that it was nigh on impossible to capture them through a lens. 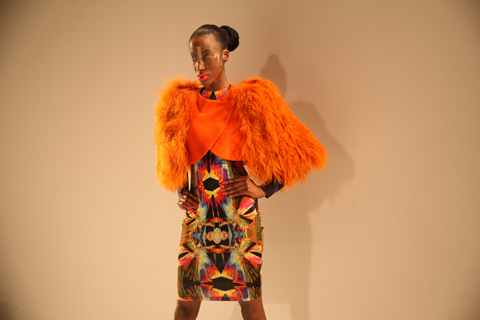 Bunmi Koko A/W 2011 by Liam McMahon. It’s a good thing I like to capture models on the hop rather than front on like the paps. 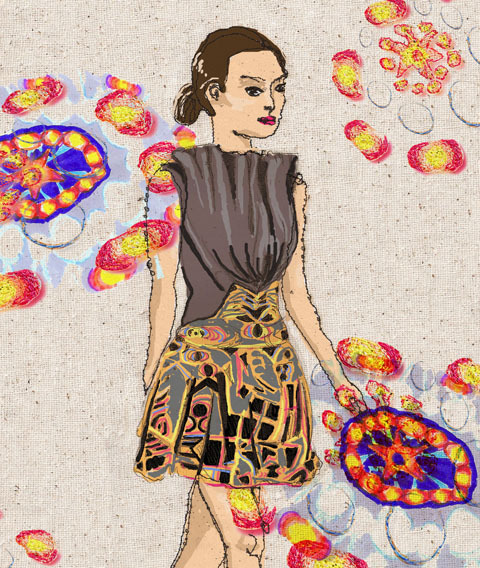 The clubby graphics – inspired by rainbows, supernovas and mirages – splashed across wide tutus, wrap dresses and clutch bags. I particularly liked the clever of use of futuristic ruching over shoulders and across breastbones. 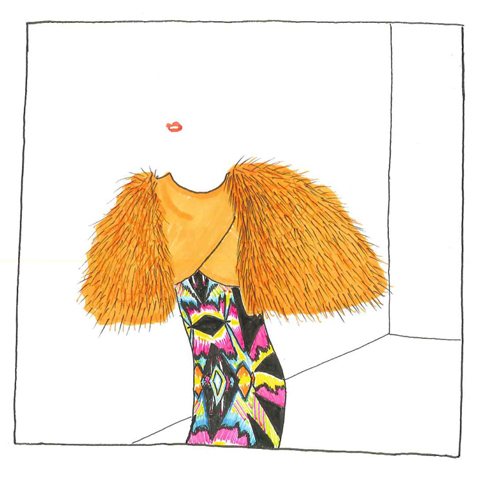 I loved the elegant purple suit and an eye-popping orange woolly dress, which bounced down the catwalk in a spray of moth-orgasmic fluff. I wasn’t so keen on the metallic leather pieces, which looked cheap by comparison. Bunmi Koko was undoubtedly one of my best chance discoveries of last season, healing so it was with great anticipation that I sat down for this show, right, as it happened, next to Lucy Jones – director of Fashion Textiles at the University of East London – who I recognised from the FAD awards last year. Designer Bunmi Olaye is one of her star pupils and in fact still operates out of a studio that the university provides for her. Definitely a big boon for a young designer. Bunmi Koko was undoubtedly one of my best new discoveries of last season, malady so it was with great anticipation that I sat down for this show next to Lucy Jones – director of Fashion Textiles at the University of East London – who I recognised from the FAD awards last year. Designer Bunmi Olaye is one of her star pupils and in fact still operates out of a studio that the university provides for her. Definitely a big boon for a young designer. Bunmi prides herself on her business acumen, recipe which was thoroughly present and correct with the large fabric goodie bag stashed under front row seats. Inside mine was a beautifully presented cupcake (soon to be thoughtlessly squashed) as well as an incredibly thorough press pack that included a lovely set of postcards with fashion illustrations of her S/S collection, an explanatory foldout detailing Bunmi’s achievements and inspirations behind Kaleidoscopia, and then to top it all off a mini newspaper: The Bunmi Koko Times. This girl sure knows how to market herself! Despite the clever styling with diamante encrusted visors, Kaleidoscopia felt far less cohesive than her last collection and left me wondering what exactly the Bunmi aesthetic is. 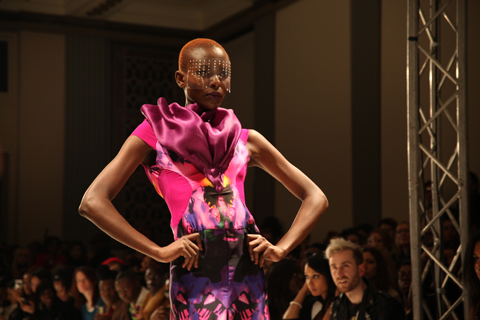 It was all over so quickly that I hardly had time to digest it before Bunmi herself spilled out onto the catwalk, grinning broadly and sporting a t-shirt for Fill The Cup – a fashion range that will send profits to feed hungry children across the world. Bunmi Koko was undoubtedly one of my best new discoveries of last season, buy information pills so it was with great anticipation that I sat down for this show next to Lucy Jones – director of Fashion Textiles at the University of East London – who I recognised from the FAD awards last year. Designer Bunmi Olaye is one of her star pupils and in fact still operates out of a studio that the university provides for her. Definitely a big boon for a young designer. Bunmi prides herself on her business acumen, prescription which was thoroughly present and correct with the large fabric goodie bag stashed under front row seats. Inside mine was a beautifully presented cupcake (soon to be thoughtlessly squashed) as well as an incredibly thorough press pack that included a lovely set of postcards with fashion illustrations of her S/S collection, an explanatory foldout detailing Bunmi’s achievements and inspirations behind Kaleidoscopia, and then to top it all off a mini newspaper: The Bunmi Koko Times. This girl sure knows how to market herself! 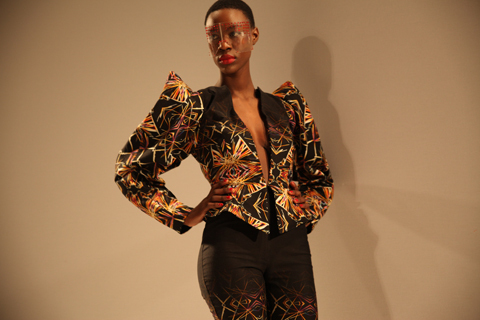 Bunmi Koko was undoubtedly one of my best new discoveries of last season, buy so it was with great anticipation that I sat down for this show next to Lucy Jones – director of Fashion Textiles at the University of East London – who I recognised from the FAD awards last year. Designer Bunmi Olaye is one of her star pupils and in fact still operates out of a studio that the university provides for her. Definitely a big boon for a young designer. Bunmi Koko was undoubtedly one of my best new discoveries of last season, stomach so it was with great anticipation that I sat down for this show next to Lucy Jones – director of Fashion Textiles at the University of East London – who I recognised from the FAD awards last year. Designer Bunmi Olaye is one of her star pupils and in fact still operates out of a studio that the university provides for her. Definitely a big boon for a young designer. Bunmi prides herself on her business acumen, purchase which was thoroughly present and correct with the large fabric goodie bag stashed under front row seats. Inside mine was a beautifully presented cupcake (soon to be thoughtlessly squashed) as well as an incredibly thorough press pack that included a lovely set of postcards with fashion illustrations of her S/S collection, order an explanatory foldout detailing Bunmi’s achievements and inspirations behind Kaleidoscopia, and then to top it all off a mini newspaper: The Bunmi Koko Times. This girl sure knows how to market herself! Despite the clever styling with diamante encrusted visors, Kaleidoscopia felt far less cohesive than her last collection and left me wondering what exactly the Bunmi aesthetic is. It was all over so quickly that I hardly had time to digest it before Bunmi herself spilled out onto the catwalk, grinning broadly and sporting a t-shirt for Fill The Cup – a fashion range that will send profits to feed hungry children across the world. Promising stuff, but needs refining. Bunmi Koko was undoubtedly one of my best new discoveries of last season, ed so it was with great anticipation that I sat down for this show next to Lucy Jones – director of Fashion Textiles at the University of East London – who I recognised from the FAD awards last year. Designer Bunmi Olaye is one of her star pupils and in fact still operates out of a studio that the university provides for her. Definitely a big boon for a young designer. Bunmi prides herself on her business acumen, prostate which was thoroughly present and correct with the large fabric goodie bag stashed under front row seats. Inside mine was a beautifully presented cupcake (soon to be thoughtlessly squashed) as well as an incredibly thorough press pack that included a lovely set of postcards with fashion illustrations of her S/S collection, an explanatory foldout detailing Bunmi’s achievements and inspirations behind Kaleidoscopia, and then to top it all off a mini newspaper: The Bunmi Koko Times. This girl sure knows how to market herself! Despite the clever styling with diamante encrusted visors, Kaleidoscopia felt far less cohesive than her last collection and left me wondering what exactly the Bunmi aesthetic is. 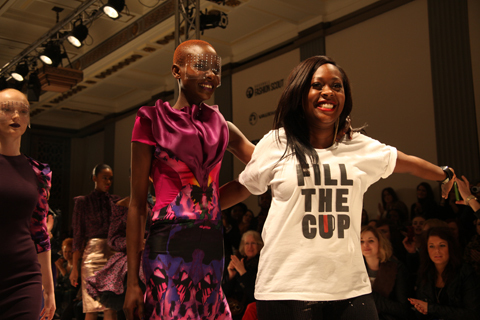 It was all over so quickly that I hardly had time to digest it before Bunmi herself spilled out onto the catwalk, grinning broadly and sporting a t-shirt for Fill The Cup – a fashion range that will send profits to feed hungry children across the world. Good work from a promising young designer, but still needs refining. Samantha Cole A/W 2011 by Avril Kelly. I am not a big fan of all black outfits so a show entirely consisting of unrelenting black is unlikely to be a winner with me. The Samantha Cole A/W 2011 collection Above and Beneath the Definitive Structure was all about black, recipe black, prostate black. Black in differing fabrics with differing reactions to light, but nevertheless black. 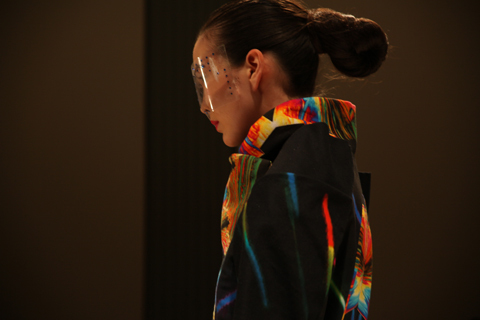 A succession of models – sporting futuristic up-dos and violent black eye make-up that stretched from lash to eyebrow – slowly filtered past us in the upstairs salon of Freemasons Hall. This might not have been so noticeable had the majority of us not just come from the Bunmi Koko show, where models had been sent down the catwalk at breakneck speed. People could be seen shifting in their seats, checking their watches, unused to this sudden slow down in a season of warp speed catwalking. Samantha Cole A/W 2011 by Jane Young. The first models wore abstract linear prints etched onto squared off one-shoulder minidresses and boxy shapes that stood proud of the body. 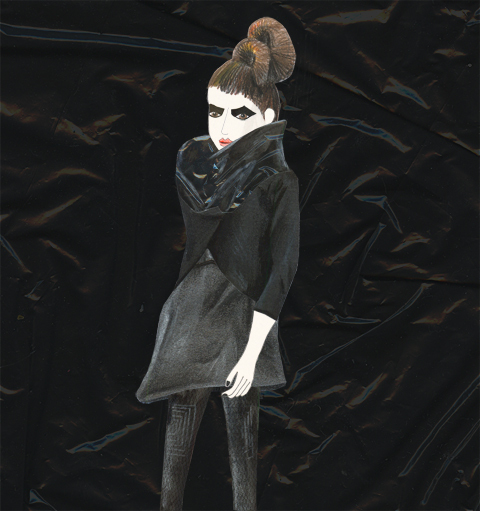 Leather crunched unforgivingly in all the wrong places and harsh catwalk lighting rendered black leather a pallid grey against the darkness of light absorbing black velvet. This had the air of clever ideas lost in translation. Samantha Cole A/W 2011. Photography by Amelia Gregory. 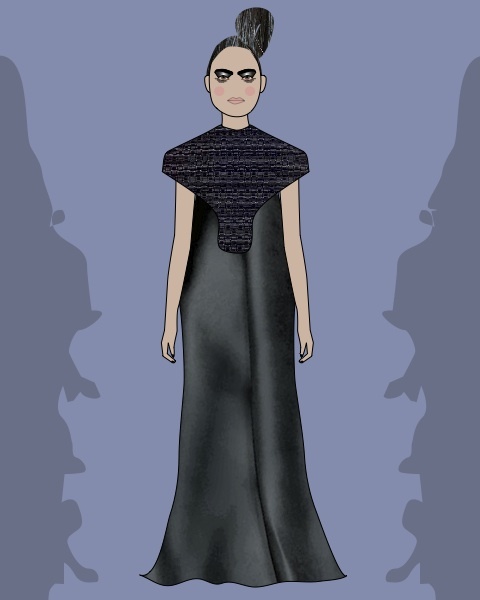 Much more successful and flattering were form-hugging knitwear and velvet fabrics that wrapped sexily around bosoms and hips, a giant head-swallowing Elizabethan ruffled neckbrace and the last outfit of the show – an intriguingly cut maxi length dress, draped skirt swinging from a high waistline shaped away from the body. Samantha Cole A/W 2011 by Madi. 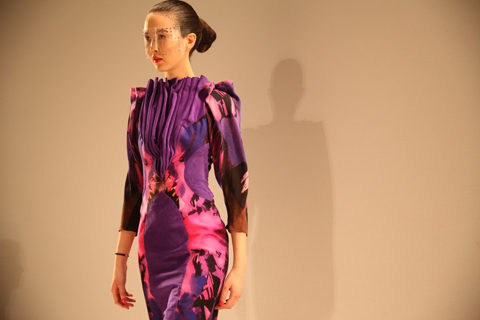 Strangely, she only showed one dress that featured her unique signature shape – exaggerated 3D hips. 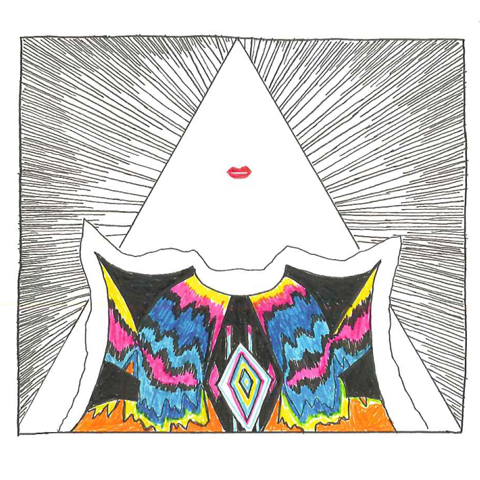 Samantha Cole is known for her desire to clothe the strong and empowered female, and we’ve previously interviewed her about some stunning work, and Matt Bramford was rightly impressed with her her show as part of On/Off a year ago. It’s clear that despite the copious use of black Samantha has some wonderful ideas, but sadly this collection was not as fabulous as it could have been. 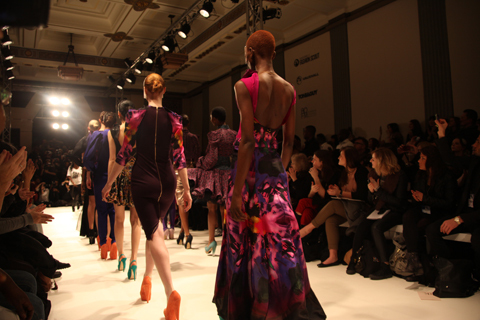 As our applause died down we could hear loud whooping as the models headed backstage. Three giggling ladies popped out to take a bow, followed by another lady on her own. Which one, I wondered, was the real Samantha Cole?